Interesting option to devote some time swimming in Antrim. Is it not your first time here? Tell us how it went utilizing the Facebook comments below or contacting us directly! 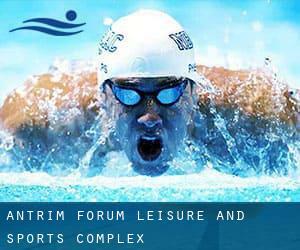 Antrim Forum Leisure and Sports Complex is only one of all the swimming pools Swimia is offering you, and its information has been shared with us by a swimmer like you.Recall you can now promote Antrim Forum Leisure and Sports Complex by sharing this page together with your friends, adding comments and linking to us. This sports centre delivers 25 meters, 6 lanes, Indoors. Contact details for this Swimming Pool such as phone number and e-mail address are number. Avoniel Road , East Belfast , Belfast , Northern Ireland , UNITED KINGDOM (Postal Code: BT 5 4SF). This sports centre offers 25 meters, Indoors. Contact information and facts for this Swimming Pool such as phone number and e-mail address are number. 12, Lisburn Leisure Park , Lisburn , Northern Ireland , UNITED KINGDOM (Postal Code: BT28 1LP). This sports centre offers 25 meters, 8 lanes, Indoors. Contact information for this Swimming Pool such as phone number and email address are number. Botanic Park , Belfast , Northern Ireland , UNITED KINGDOM (Postal Code: BT 9 5EX). Among all the activities supplied by the centre, should you be interested in swimming you are going to enjoy 25 meters x 13 meters, 6 lanes, 1.2 meters depth, 1.2 meters depth, Indoors. If you need to contact this Pool, email address and phone number are both number. Trostan Avenue , Ballymena , Northern Ireland , UNITED KINGDOM (Postal Code: BT43 7BL). Swimmers like you have reported 25 meters, 6 lanes, Indoors. Also, you will find 20 meters, Indoors. If you have to contact this Swimming Pool, email address and phone number are both number. Prince William Way , Carrickfergus , Northern Ireland , UNITED KINGDOM (Postal Code: BT38 7HP). Swimmers like you reported 25 meters, 6 lanes, Indoors. Phone number and e-mail address are number for this Swimming Pool. Church Road , Newtownabbey , Northern Ireland , UNITED KINGDOM (Postal Code: BT36 7LJ). Swimmers like you reported 25 meters x 12 meters, 6 lanes, 0.9 meters - 1.9 meters depth, 0.9 meters - 1.9 meters depth, Indoors. Unfortunately we do not have the e-mail address of this Swimming Pool, but we can give you the phone number. Ballysillan Road , North Belfast , Belfast , Northern Ireland , UNITED KINGDOM (Postal Code: BT14 7QP). Among all the activities offered by the centre, if you are thinking about swimming you are going to enjoy 25 meters, 5 lanes, Indoors. If you must get in touch with this Swimming Pool, email address and phone number are both number. Whiterock Road , West Belfast , Belfast , Northern Ireland , UNITED KINGDOM (Postal Code: BT12 7RJ). Among all the activities offered by the centre, for anyone who is considering swimming you will appreciate 25 meters, Indoors. If you should contact this Swimming Pool, email address and phone number are both number. 3rd Floor Cityside , 100-150 York Street , Belfast , Northern Ireland , UNITED KINGDOM (Postal Code: BT15 1WA). Among all the activities offered by the centre, when you are considering swimming you will enjoy 25 meters, Non-Chlorine Sanitized, Indoors. If you will need to get in touch with this Swimming Pool, email address and phone number are both number. Castle Upton Estate , Templepatrick , Northern Ireland , UNITED KINGDOM (Postal Code: BT39 0DD). Among all of the activities supplied by the centre, if you are considering swimming you will appreciate 18 meters x 8 meters, Indoors. Just in case you want to contact this Pool before dropping by, we only know the phone number. Ballynure Road , Ballyclare , Northern Ireland , UNITED KINGDOM (Postal Code: BT39 9YU). Among all the activities offered by the centre, if you're interested in swimming you can expect to get pleasure from ~25 meters x ~12 meters, Indoors. Just in case you want to contact this Pool before dropping by, we only know the phone number. 15/17 Falls Road , West Belfast , Belfast , Northern Ireland , UNITED KINGDOM (Postal Code: BT12 4PH). Among all the activities offered by the centre, if you are thinking about swimming you will take pleasure in 25 meters, 5 lanes, adjustable depth, Indoors. If it is advisable to contact this Swimming Pool, email address and phone number are both number. 117 Milltown Road , Shaws Bridge , Belfast , Northern Ireland , UNITED KINGDOM (Postal Code: BT 8 7XP). This sports centre offers 20 meters x 8 meters, Indoors. Contact info for this Swimming Pool just like phone number and email address are number.